Recognize that lyric? It’s from one of my all time favorite musicals, Rent, written by Jonathan Larson. By now you will have probably guessed that Jenn, Elisa, and I are total musical theater geeks. And as any musical theater geek will know, New York is not only the center of the universe, it’s the center of the musical theater world. So, several years ago we decided that while going up for one day trips to see shows a few times a year was great, it just wasn’t enough. We started organizing our “Annual Spring NYC Girls Weekend Getaway.” What could be better than a weekend full of good theater, tasty food, fabulous friends, and of course, cupcakes? Unfortunately this year, Jenn wasn’t able to join us (it’s okay, we aren’t holding any grudges against baby Leah). Since it’s become our tradition, the three of us decided that Elisa and I should still go without her. Other than cupcakes, our first day in NYC consisted of lunch, hanging out with good friends, attending the theater (we saw End of the Rainbow – I highly recommend it! ), and post show drinks. We couldn’t have asked for a better day and we were happily able to sprinkle cupcake eating conveniently throughout. 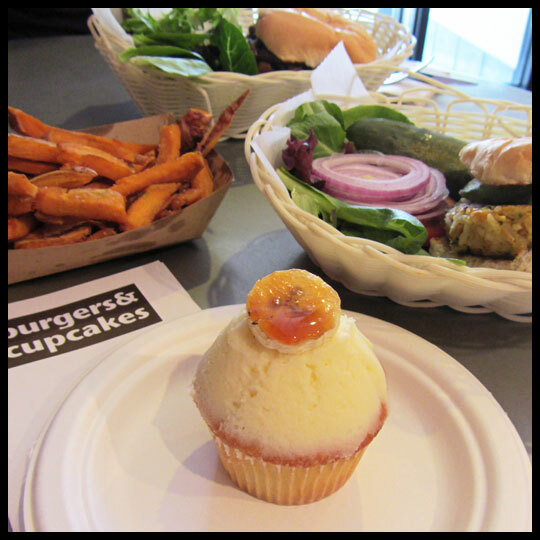 Our first cupcake of the day was from Burgers & Cupcakes. 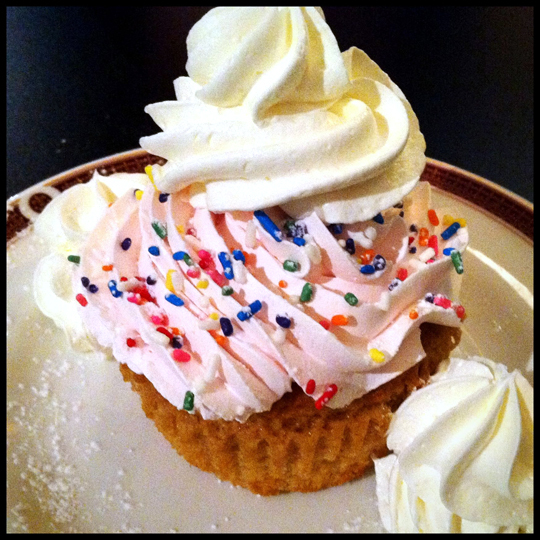 Burgers & Cupcakes is situated just a few blocks away from Penn Station on 9th Avenue. Crusader Elisa and I have tried several of their cupcakes before, but we’ve never sat down to try their burgers so on this trip, we decided that needed to be remedied and went straight there for lunch after arriving in the city. We each ordered their homemade veggie burger with toppings of our choice and choose the Banana Vanilla cupcake to share. 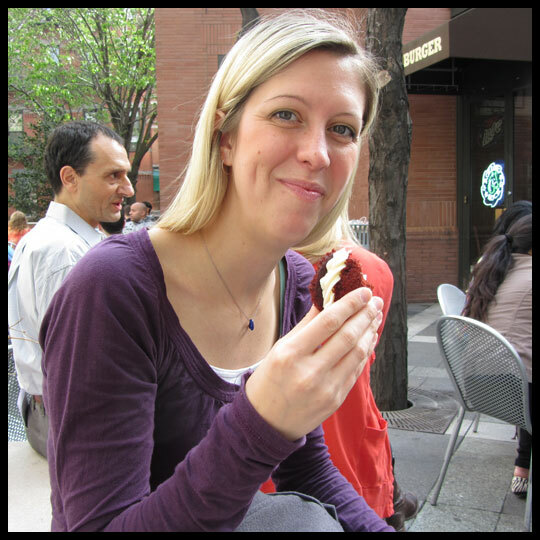 After savoring the delicious burgers and munching on some sweet potato fries we sat and chatted with a friend who met up with us before splitting the cupcake up for tasting. I’ll be honest, while we were chatting my eyes kept wondering back to the cupcake, but it was well worth the wait. The banana was the primary focus of this cupcake with the vanilla sitting in the background. The cake was moist and light and the frosting just sweet enough. It was our first cupcake of the weekend and it was a huge success! After checking into our hotel we headed to our second cupcake stop, Donna Bell’s Bake Shop found on 49th Street between 8th and 9th Avenue. Lucky for us, Donna Bell’s is right next to the courtyard in which Blockheads and Mother Burger are located. For those who don’t know, Blockheads (and their sister restaurant, Mother Burger) makes a fierce drink called the Pink Bulldog with a Coronarita flipped upside down into it. It is basically a frozen vodka pink lemonade with sangria on top and then finished with the Corona. It may sound strange, but it is so good and went PERFECTLY with the Coconut cupcake I purchased from Donna Bell’s. Being the red velvet Crusader, Elisa had to get the Red Velvet , but based off her reaction it wasn’t nearly as good as my choice. The Coconut cupcake had a thick layer of sweet frosting and was then coated in coconut shavings. The edges of the cupcake were a little crisp, as if they had been touching the pan during the baking process, and this gave the cupcake a toasted coconut flavor, which I loved. 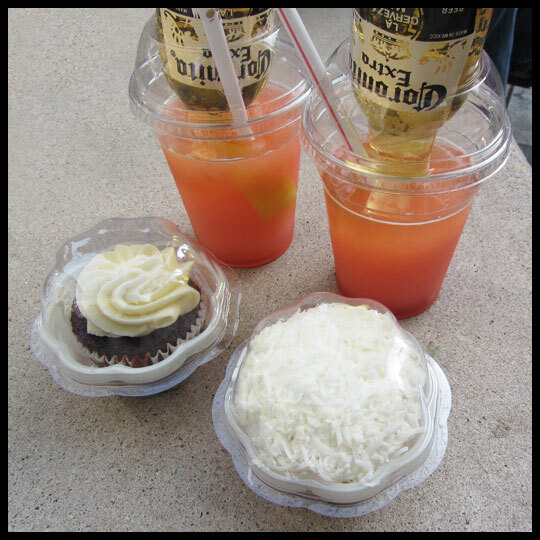 Between the fruity frozen drink and the Coconut cupcake I felt like I should be sitting on the beach, not in the center of busy Manhattan. So far, I was two for two on day one. The day continued on with more food, more time with good friends, and finally, our main reason for being there, some theater! 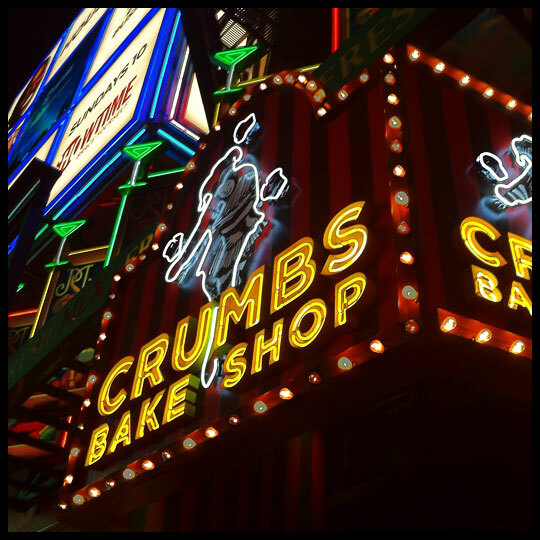 Before leaving Baltimore, I had already decided where we would be getting our post-show cupcake from: Crumbs Bake Shop. Even though Crumbs is a chain cupcakery, it has been a favorite of ours for a long time. Their jumbo cupcakes have always been moist and full of flavor. Last week I saw that their flavor of the week would be Apple Honey and I knew I had to try it. Elisa and I decided to go to Crumb’s new Time Square location on 42nd Street since it was on our way to meet up with another friend. I usually try to avoid 42nd Street at night, but we were on a mission so decided we had no choice and had to tackle the crowds. After weaving through the mob of people we were shocked to see that Crumb’s display was still packed with cupcakes. 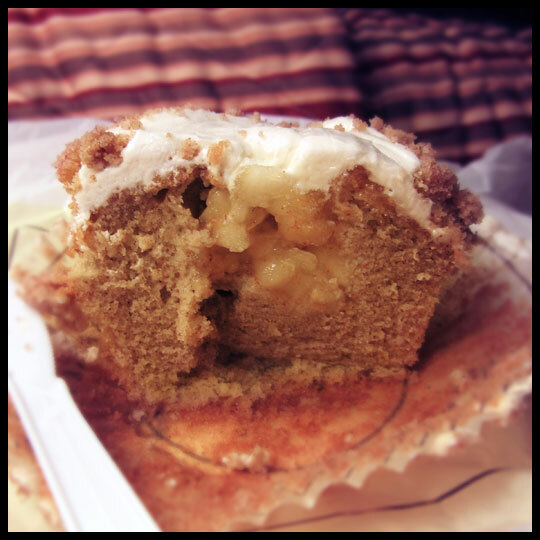 And sitting in there waiting for us, was the Apple Honey cupcake which had made me drool at my desk just a few days earlier. 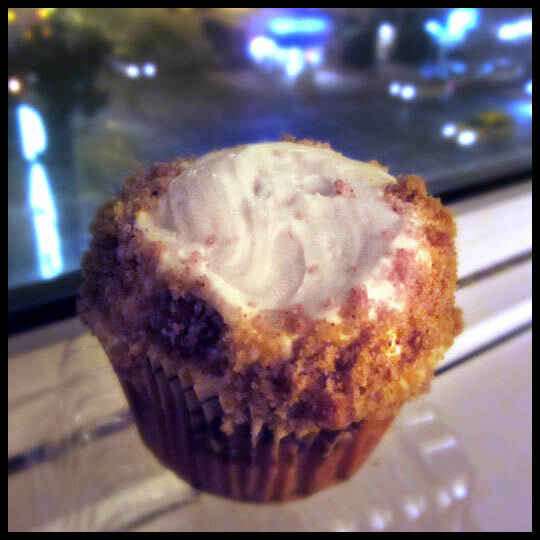 We took the cupcake to go and ended up sharing it in our hotel room later that night. I’ll be honest, it’s not easy having a “cupcake photoshoot” with the sweet aroma of apples in the air, but I managed and we finally cut the cupcake in half to share, only to discover a delightful surprise: apple pie filling! This cupcake was every bit as good as I expected it to be. The honey flavor was a bit hard to detect, but it didn’t stop me from enjoying each bite. Normally the Crusaders are okay with splitting Crumbs cupcakes since they are so large, but on that night, I think I can speak for Elisa and myself when I say, we both wish we had each had one whole cupcake to ourselves. Hipp Cafe’s Giant Rainbow Cup Cake: Not a Shinning Star at this Theater’s Cafe. While I’m sorting through photos from my recent adventures in Ontario (yes, there were cupcakes) I wanted to share this short review from a surprise cupcake the Crusaders and I encountered last week. You may not know this about us, but some might consider us theater nerds. Okay, it’s true. We are total theater geeks and we love every minute of it. 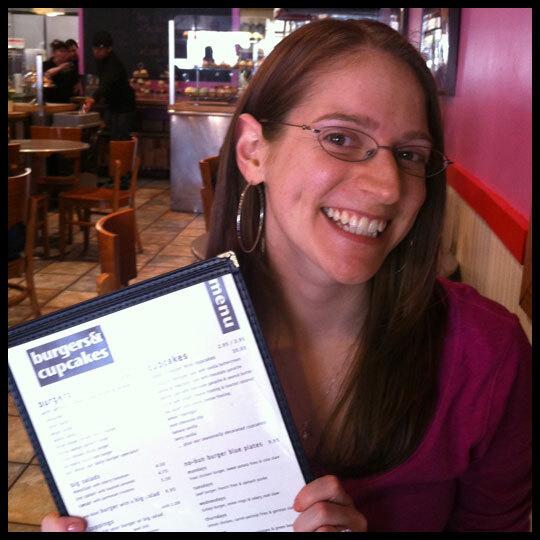 Last week, on our recent trip to the Hippodrome Theater in Baltimore, to see the National Tour of the Broadway revival La Cage Aux Folles, we decided to have dinner at the theater’s cafe, Hipp Cafe. Crusader Elisa was running a bit behind and Crusader Jenn wouldn’t be joining us until shortly after dinner, so I went ahead and waited in line to place our order since it was quite busy. While studying the menu and deciding what to order I saw “Giant Rainbow Cup Cake” listed under the desserts section. I thought the use of “Cup Cake” (two separate words) was a little strange, and knew I was going to be ordering one as a surprise for the girls (strange things intrigue me). When I got to the counter, I saw that it wasn’t really anything unusual at all, just a normal, but large, cupcake. I have to admit that since I was reading off the menu, the way they used two words for “cup cake” threw me off a little bit and I actually ended up giving a pause between them while ordering. I definitely sounded a little awkward but the woman helping me didn’t seem to notice. Or she was just too kind to let on. When the cupcake arrived it was decorated in the typical cupcake fashion except that the cupcake wrapper had already been removed and 3 swirls of whipped cream were added. I don’t think the whipped cream was necessary since the frosting was actually a whipped frosting too, but I guess they were trying to make it a bit fancy. The frosting was almost identical to that which usually accompanies a carton of cheap cupcakes in the bakery section of a grocery store. If I recall correctly, the cupcake was about $4, so for the price, the quality isn’t what I expected. The cake was really dense and sweet. It almost had a caramelized sugar taste, without tasting like caramel (confusing, I know, but it was actually pretty good). Elisa thought that the combination of the frosting and the cake resembled the flavor of cotton candy.